Outright indulgence followed. 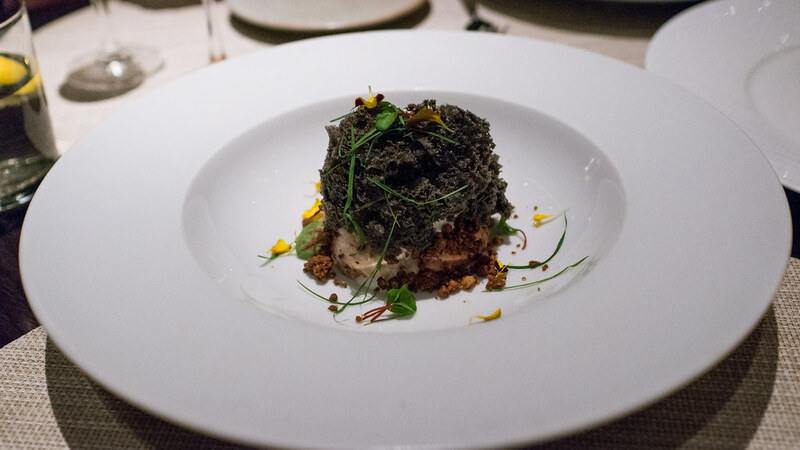 A silky asparagus risotto was topped with mounds of Maine lobster, and a hillock of last of the season shaved black truffles. 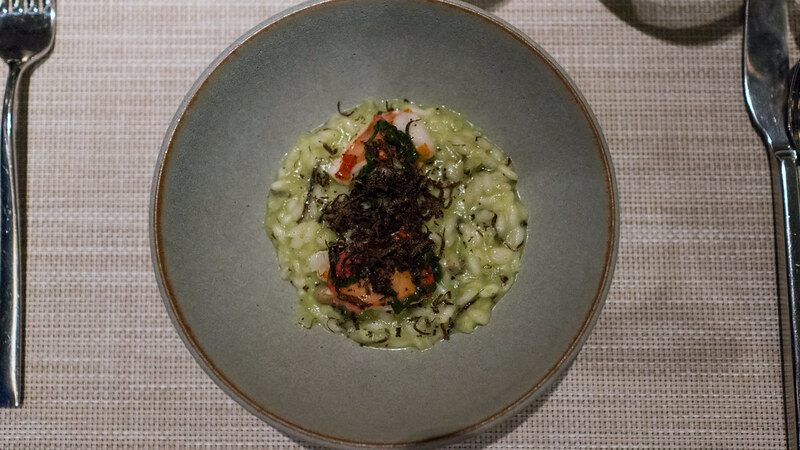 When the risotto is made right, and the lobster is tender and meaty, and the truffles still carry their earthy perfume, there's nothing not to like here. Typically when you use a luxury ingredient like caviar, you flaunt it. 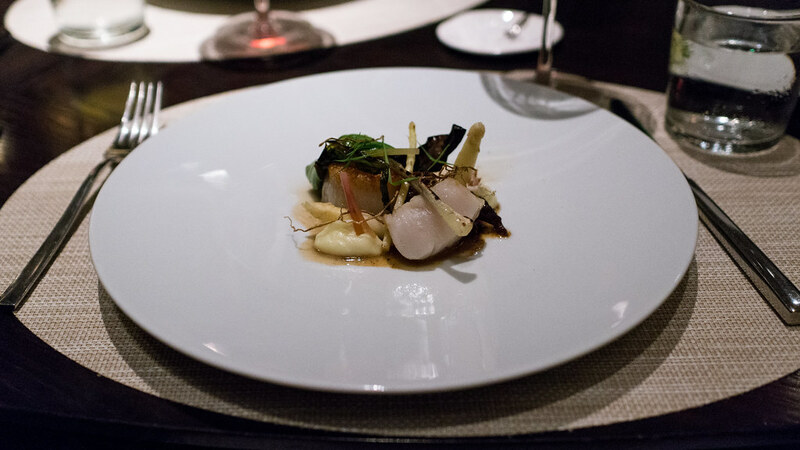 Instead, Brad literally buried it under a puffy white asparagus mousse, torched with brown pockmarks on the surface. 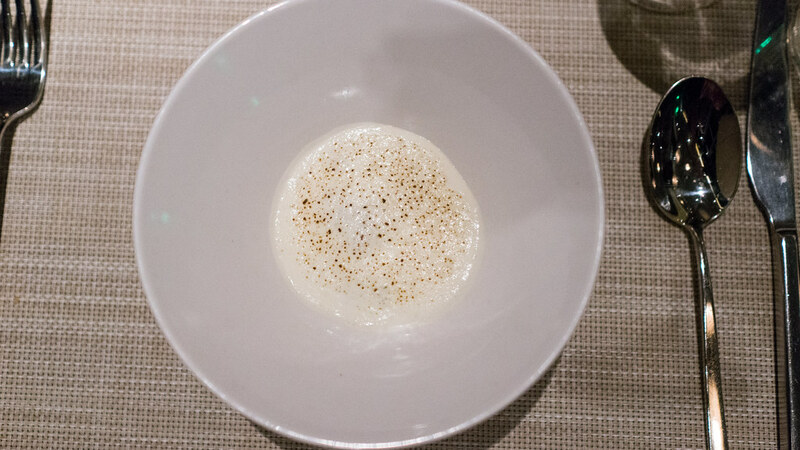 A soft egg and pungent, crispy garlic chips also hid within, providing additional contrasts against the firm, saline pop of the caviar. 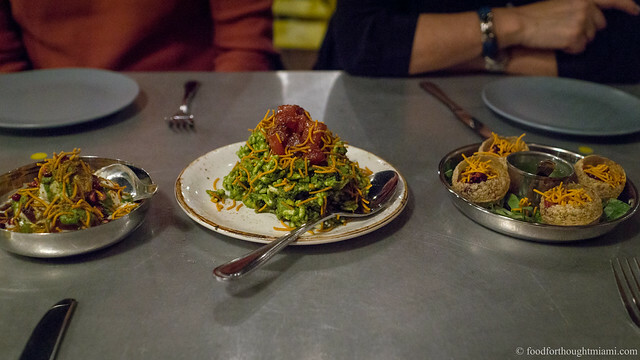 The oxtail in the prior dish whispered "umami." The next dish bellowed it. 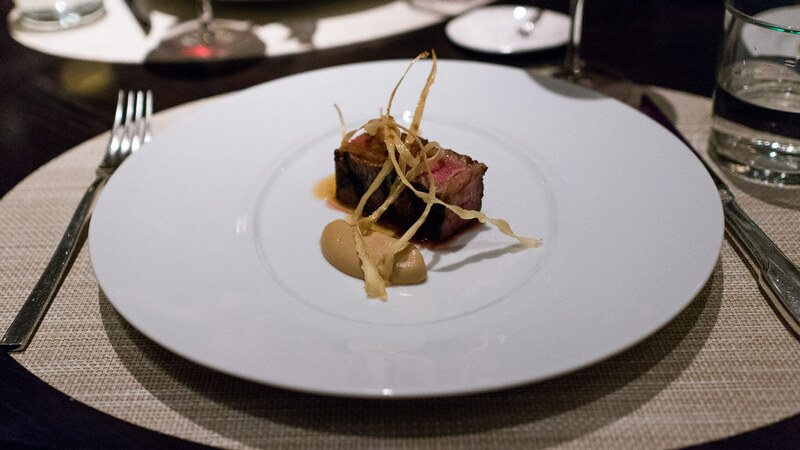 A tranche of wagyu ribeye combined deeply browned crust and fat with a juicy red interior. A golden-hued, caramelized parsnip purée reinforced and echoed all those deep, maillard-y flavors. A spoonful of tamari jus struck the chord one more time. It was one of the best steaks I've had all year. Then it was Antonio Bachour's turn. I am not typically all that passionate over dessert, but I am a big fan of Antonio's desserts. 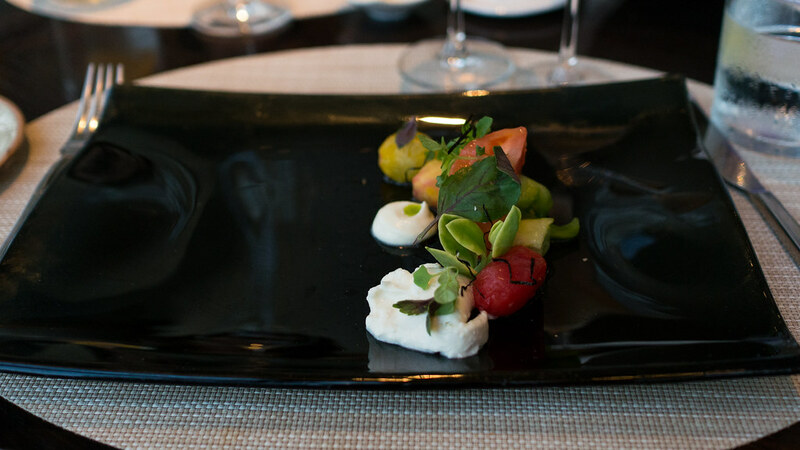 They are visually stunning, no doubt, but in some hands, presentation becomes a focus at the expense of flavor. Bachour's desserts are every bit as exciting to eat as they are to look at, always bringing multiple flavors and textures that overcome any sugar fatigue. All of these dishes are from his upcoming second book (his first book, "Bachour," with photography by Alan Battman, is still available). 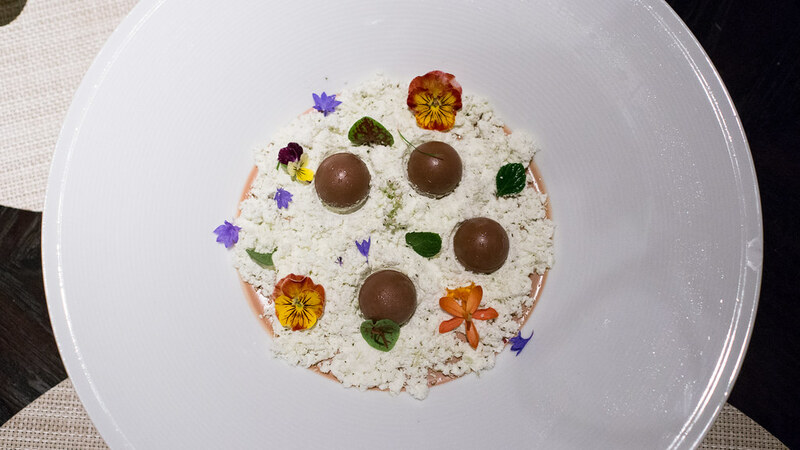 The first dessert he served happens to be the cover model for the new book – a creamy chocolate custard, topped with a delicate, light-as-air mint "moss," over which are strewn chocolate truffles and an assortment of edible flowers and herbs. Even a non-dessert fan can be a sucker for the combination of chocolate and mint (York Peppermint Patties and Junior Mints are both in my wheelhouse), and this was a particularly elegant expression of that pairing. 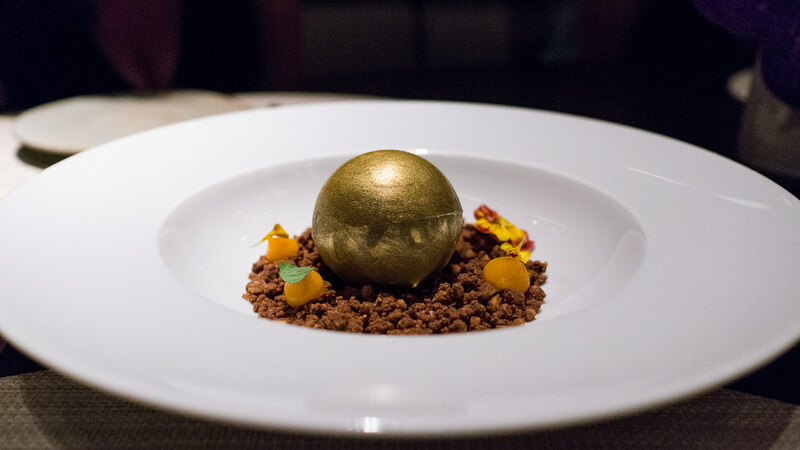 I called this the "Golden Globe" – a gilded sphere encasing a hazelnut cremeux, nestled into a bed of chocolate "sand," with some dabs of a fluffy passionfruit foam providing just the right edge of tart acidity to balance the rich, nutty flavors of the rest of the dish. 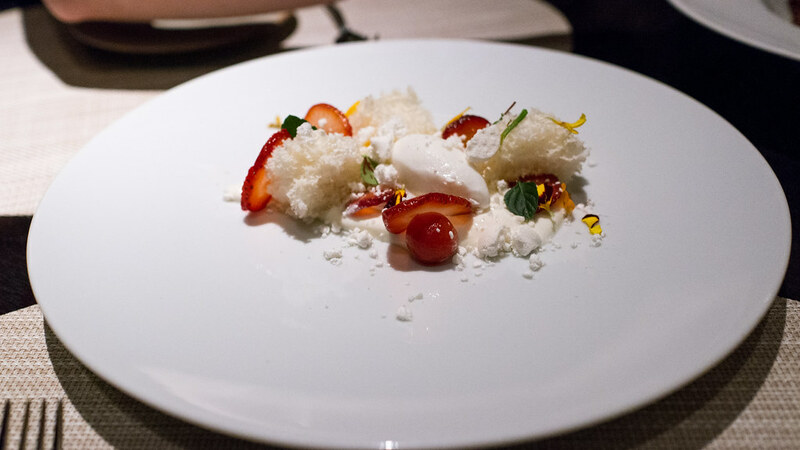 This was a sort of variation on a strawberry shortcake with a Mediterranean bent – slivered strawberries, candied tomatoes, and an airy yogurt spongecake all rest in a puddle of salted, honeyed yogurt, with a quenelle of icy, creamy Greek yogurt sorbet in the middle. The savory elements here hit all the right spots for me. 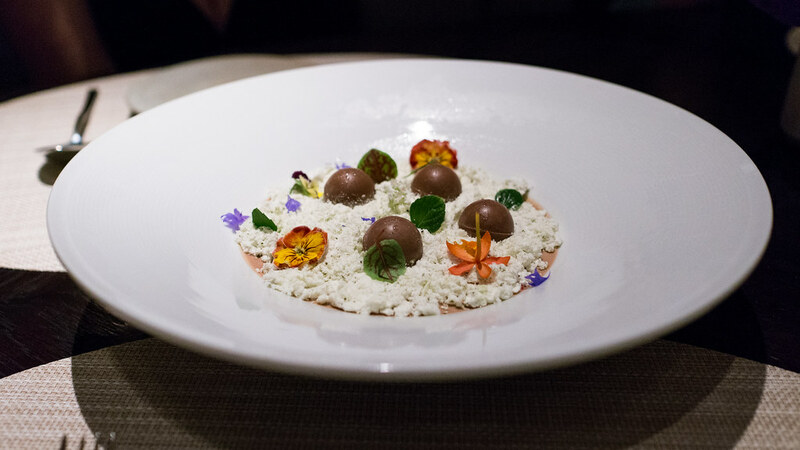 Venturing even further into savory territory, here Antonio perched a dramatically hued black sesame sponge cake atop a wasabi yogurt, along with ginger ice cream, a frozen chocolate streusel and a scatter of micro lemongrass and flowers. This spicy zing of the wasabi was fascinating: I disliked the first bite, but then kept on coming back to try more. Even for someone like myself who prefers desserts on the savory side, it was a bit challenging, but I like that kind of challenge. The flavor profiles were more traditional in this cheesecake, but still not lacking in inspiration. 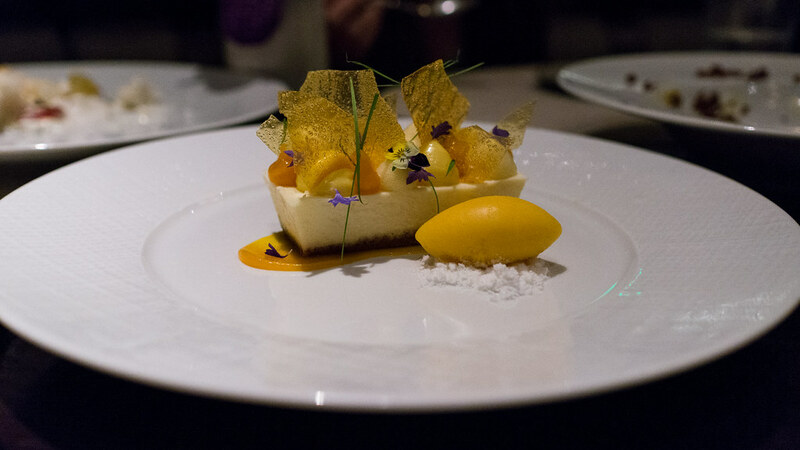 The cheesecake had the lactic tang of creme fraiche; the toppings and accompanying sorbet had the perfumed acidity of passionfruit and mango. If you read this blog regularly, you should know I don't don the cheerleader outfit very often. But it's warranted here. 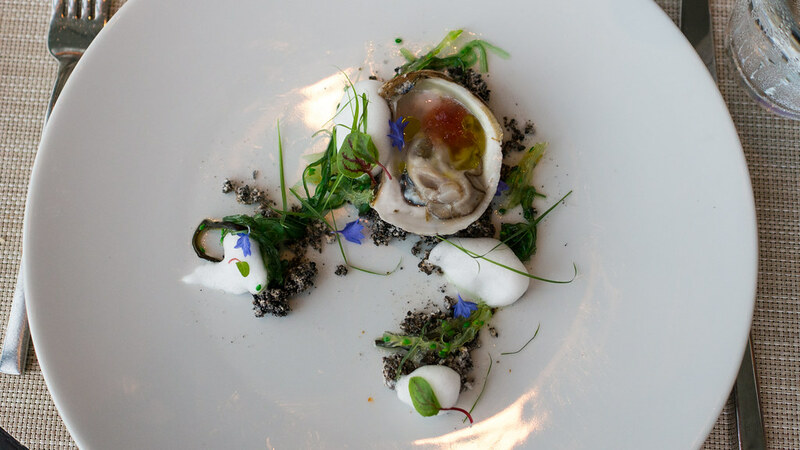 Go to J&G; order the tasting menu, or better yet, ask them (in advance) if they'll put one together for you. 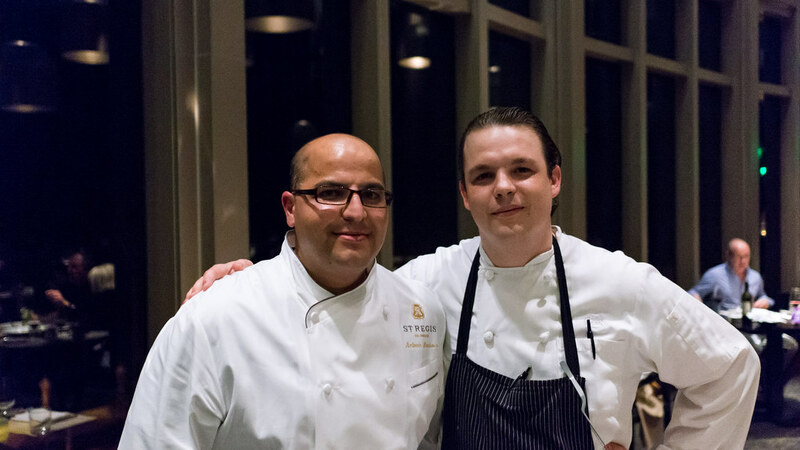 Brad Kilgore is a burgeoning young talent, and Antonio Bachour is a seriously world class pastry chef. One day you're going to want to say, "I was there when ...". By this I mean occasions where I've asked the kitchen to do a special menu for me. Generally, I think it's an unreliable barometer for a restaurant review since by definition it is not a typical restaurant experience. Who am I kidding? They almost always let me choose where to go. We've done two Cobaya dinners at the St. Regis - one back in 2012 with Richard Gras (Kilgore's predecessor as CDC) and Bachour, and another afternoon tea party more recently with Bachour. The pairings were on the mark all evening, really some of the best work on that front that I've experienced in some time. 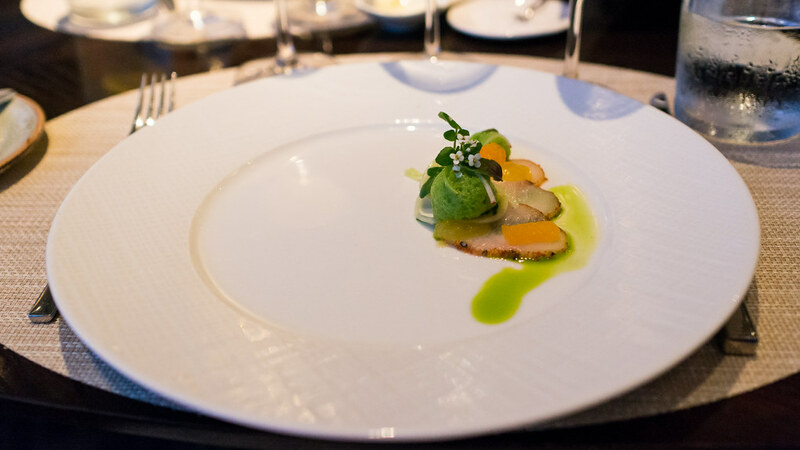 Sadly, a month later and without notes, I only recall the Leitz Riesling with the burrata dish, an equally lovely Lopez de Heredia Rioja with the scallop dish, and a classic California Cab – Inglenook – with the steak. I think I naturally don't have much of a sweet tooth, but my lack of passion for dessert may also spring from the fact that they all ultimately must prominently feature the same ingredient: sugar. It's like saying, "You can paint any picture you want, so long as it's blue." If every picture has to be blue, then (for me anyway) it presents that much more of a challenge to make every blue picture interesting. And that's a big reason why I enjoy Antonio's desserts so much – he always finds ways to make them interesting instead of just cloyingly sweet.